ROME, ITALY - APRIL 18: People have dinner in a small restaurant in Rome on April 18, 2015 in Rome, Italy. 4k00:16BUDAPEST, HUNGARY - OCTOBER 8: View of a the Vaci utca street at night on October 8, 2016 in Budapest, Hungary. hd00:15NEW YORK - AUG 1, 2014: people crossing dark SoHo cobblestone street at night with Chrysler Building and car headlights in background. SoHo is a neighborhood south of Houston Street in Manhattan, NYC. 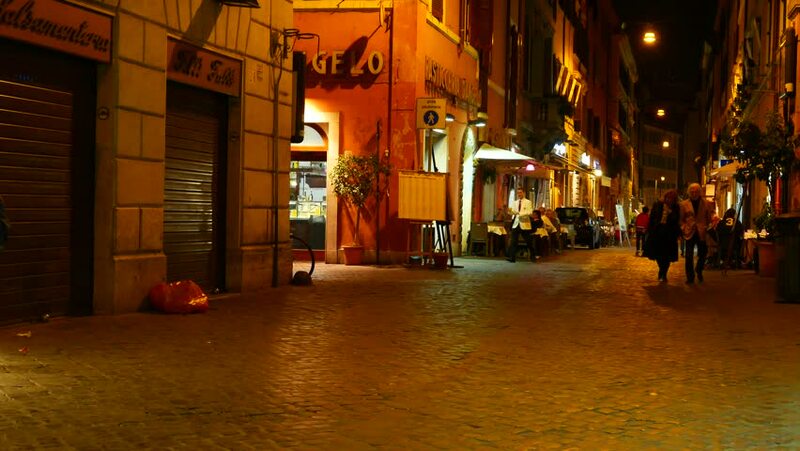 4k00:07Street of the night city without people. On the sidewalk tables cafe. 4k00:12Granada, Spain - April, 2017: Timelapse of Plaza Nueva in Granada, at night.